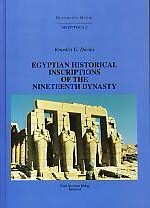 Astrom Editions AB - Egyptian Historical Inscriptions of the Nineteenth Dynasty. Översatt av Benedict G. Davies. 363 sidor. ISBN: 978-91-7081-158-6.